Because I love the children’s book publishers McSweeney’s McMullens, I have come to expect that whatever I get from them is high quality. What I didn’t expect with these two books was to be plunged into an entirely new genre of children’s literature. I was confused, surprised, and delighted all at once. Let’s begin with the easy part: the book quality. Each children’s book from McMullens is manufactured with precision and care that far exceeds any mass produced children’s book today. From the paper that is used to the images and quality of ink, each book I have gotten from them stuns me with it’s beauty, and I realize how shoddy other books have become. The next easy part is that the writing in the children’s books, including these two, is consistently exceptional. The books serve as a reminder that good children’s literature is more than just stringing words together. It is making a cohesive, well-written narrative that expands one’s mind. 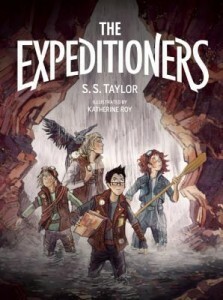 The Expeditioner’s series certainly does that. The challenge for me was diving into a new genre. I am generally not a science fiction fan, and I barely tolerate fantasy. Mostly because I can’t keep the characters straight in my mind. However, in this series, the issue is not characters, but time. When is this book taking place? Today? Tomorrow? Yesterday? There are so many anachronisms I couldn’t piece it together, although I could still follow the exciting plot without effort. Finally, just as I set out to write this review, I looked online and discovered that is precisely the point of this kind of children’s book writing. The anachronisms are part of the genre called “steampunk,” a sub-genre of science fiction and fantasy. If you don’t know of it, here’s what Wikipedia says: “Steampunk… typically features steam-powered machinery, …often set… in a post-apocalyptic future during which steam power has regained mainstream use…” No wonder I couldn’t figure out when this story takes place. The bottom line is that this series is superb. The adventures, the dangers, the daring, the unstated parallels to today’s warped political world, are both disturbing and important. What kind of world are we really living in? Who in authority is trustworthy? These kinds of difficult questions and more are raised in this daring and excellent children’s book series. For sophisticated and serious teenagers who want more than pulp fiction!